Splash liveliness into the lives of the people you care about by gifting this Rich Combo Gift Basket of Flowers and 5 Kg. Fruits that helps instantly rejuvenate the mood. 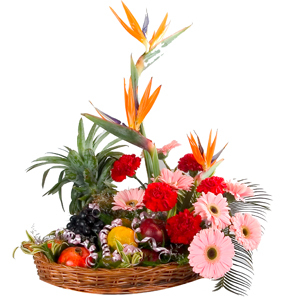 Flower compositions of this Basket are follows as Gerberas, Carnations and Birds of Paradise Flowers. It also includes plenty of Fruits like Pomegranates, Grapes etc.